The very word Aruba conjures up visions of paradise in people's minds. And it's no wonder, since this fascinating island in the southernmost part of the Caribbean has long attracted visitors to its sparkling white sand beaches. One of the most popular cruise stops in the region, Aruba dazzles with its historical architecture, secluded seaside resort villages and the friendliness of the native inhabitants. Renowned nightlife, spectacular shopping and, most of all, the feeling that you are truly in a timeless world of unlimited pleasure opportunities makes Aruba an amazing place for those who want the very best in tropical entertainment. 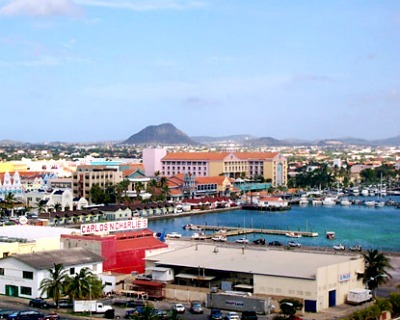 Cruise vessels arrive in the capital city of Oranjestad and anchor at a modern port facility directly in front of the central business district. The terminal is complete with information centers, souvenir shops and interactive kiosks, and there is a well-defined taxi area outside the facility. Many of the historical downtown buildings, restaurants and bars are located on the main avenues running from the waterfront to the center of the town. Most people come here for the beaches and the fine weather, and there is no denying that Aruba exceeds expectations on both fronts. The climate is very mild, with ever so slight temperature variations throughout the year. The island receives less than 20 inches of annual rainfall, far less than many of the other well-known islands in the Caribbean, therefore enjoying the sun and surf is virtually guaranteed. The famous Eagle Beach is the longest stretch of white sand on the entire island and is a favorite of both locals and visitors. Only a 10 minute taxi ride from the cruise terminal, it can be crowded, but the gentle surf and multitude of nearby shops makes it a must stop while visiting the island. Families with kids will love the Butterfly Farm located nearby. Palm Beach is another popular getaway for an afternoon, featuring snorkeling and scuba lessons, a wide variety of snack shops and also a number of resort casinos. The Royal Plaza and Seaport Village Mall, directly adjacent to the cruise docks, offer the best mix of souvenir and jewelry shopping in the city of Oranjestad. Along the downtown waterfront, visitors will marvel at the Dutch Colonial architecture, and for those wanting a bit of the out-of-town adventure, check out the famous California lighthouse, located on the extreme northwest cape and offering some of the best dune surfing on the island. On L.G. Smith Boulevard visitors flock to the Pinchos Grill and Bar, one of the most popular late night eateries in Oranjestad. While at Palm Beach, many visitors will enjoy lunch at the Pelican Grill, located on an extended pier and serving up delicious seafood platters. At the Amsterdam Manor Beach Resort (at 252 J.E. Irausquin Blvd.) is the highly recommended Passions on the Beach restaurant, which is noted for its beautifully decorated seating, grilled fish and never-ending samplers. If coming ashore from the cruise ship, walking is the preferred method for exploring the downtown. Taxis are affordable and can take visitors to all the popular beaches and casinos. Public bus service connects Oranjestad to all the other communities on the island and is a great way to see the outlying terrain. Rental cars can be reserved before the cruise and there are pickup services right at the cruise terminal. Dutch is considered the native language of Aruba, but most of the locals speak English fluently. The currency unit is the Aruban florin, and there are plenty of banks and ATMs for exchanging and withdrawing. Most of the larger hotels have Internet cafes and easy long distance calling operations. The Royal Plaza Mall has the largest Internet cafe on the island, just a few blocks from the cruise terminal. 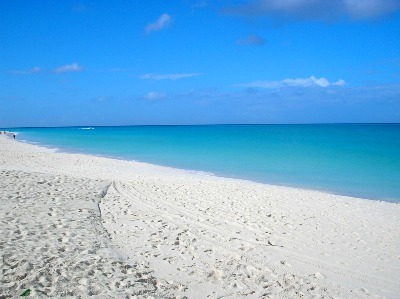 The famous Eagle Beach with its long stretches of beautiful white sand. 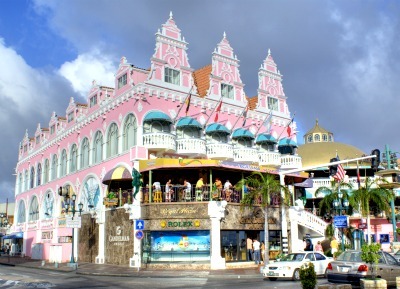 Oranjestad is the capital and the biggest community of the Aruba. 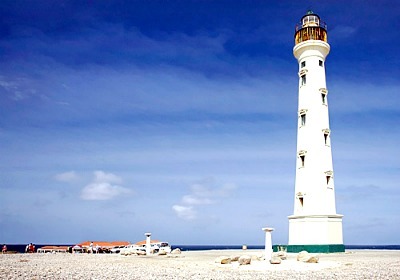 The California lighthouse - an eye-catching scene a bit outside of Oranjestad. The Royal Plaza is a favorite place for shopping and dining.